Pavillon Gabriel is located in the gardens of the Champs Elysees, dubbed as the ‘World’s Most Beautiful Avenue’. 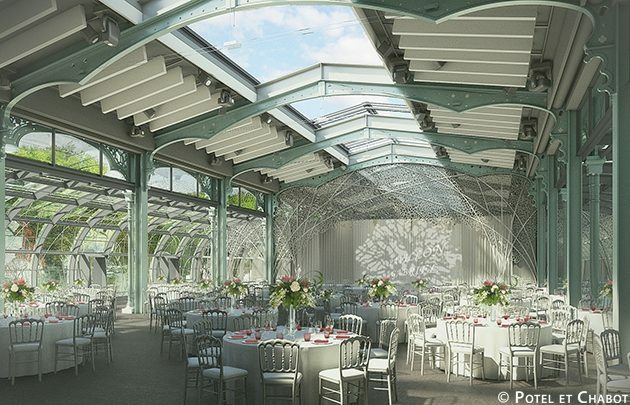 The dedicated event space managed by Potel & Chabot has undergone a renovation project spanning 11 months, to regain its former glory and elegance of the great greenhouses of the mid-late nineteenth century. The new design highlights the original architectural features with the use of glass and natural light. The transformation includes the introduction of a skylight, increased ceiling heights and a glass roof running 8 metres. Guthrie Douglas were engaged by Faber France to design a shading solution for the glass roof that would ensure the comfort and protection of event attendees, throughout the seasons, while maintaining the enjoyment of the views to the outside. Using the TESS™ 440 system and Mermet Satiné fabric, we integrated motorised fabric barrels into the ceiling. The fabric is kept completely flat using a torsion spring concealed in the barrel, and then disappears completely when not in use. The combined performance of the retractable systems and the high-tech fabric provide exceptional protection from heat and glare, which reduce energy costs as well as managing user comfort. Read about another project where Guthrie Douglas worked with designers to provide heat protection for a curved glass façade.